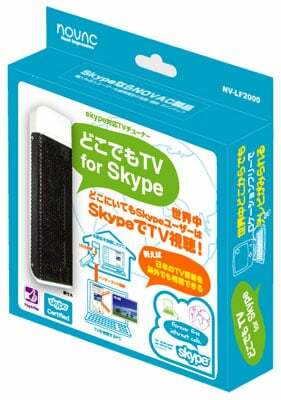 Fancy turning your copy of Skype into a watch-anywhere TV viewer? Now you can, courtesy of Japanese company Novac, which today announced a box that turns any suitably-specified PC into a machine for beaming TV shows to anyone on the internet. The key is in the software. The box itself is an analogue TV tuner - not digital, alas. The code connects the digitised video into a video-conferencing stream that can be sent via a local copy of Skype out to any other machine running the VoIP software. Sending a Skype instant message to the source lets you change channels. Right now, the system only works with the Windows XP version of Skype - other versions of the communcations tool don't yet support video-conferencing. It occurs to Reg Hardware that this may be possible with any TV tuner, if you can fool Skype into thinking the gadget is a webcam. Anyone with the right equipment want to give it a whirl and let us all know whether it works?